This poster is simple, gripping and intriguing. Obviously there isn't a whole lot going on in the poster, but what is there grabs my attention and doesn't let go. I dig the font. The tagline, "It's not human. Yet." is effective in reminding us it is a prequel and not just a remake. Finally the hand of the person pictured is pretty disturbing. John Carpenter's original 1982 horror is one of my all time favorites and I've been a bit weary of this project since it was announced back in 2008, but all things considered I still am excited to see what comes of it October 14th when the prequel releases. If it is terrible, I can rest easy that I have Carpenter's classic to enjoy. If it is actually good, then better yet, I will have a fun double feature for the future. One little concern is the title, Universal has made the decision to stick with the exact same title of "The Thing" and I'm stuck wondering is it sheer laziness or going for the familiarity factor. The film is not a remake. It is a prequel yet the audience will have no way to identifying which "The Thing" people are talking about other than the release date. 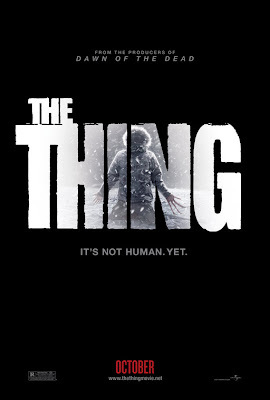 Say I ask someone if they've seen "The Thing" and their reply is which one, '82 or '11? Sure its not that big of a deal in the long run to clarify but if it leaves a tiny bit of confusion even if for just one second, that could be enough to turn some audiences away. I guess you could easily also say, "the prequel" but what about younger audiences who have never seen the original? I don't know. General audiences like familiarity so that make sense but I kinda wish Universal went the extra mile for the property by giving it an identifier from the original. 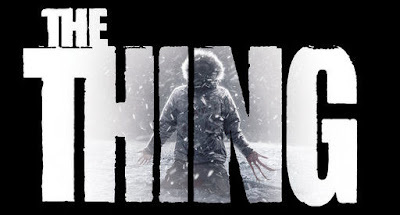 I will cede that most of the generic titles like 'The Beginning,' 'Rises' or 'Begins' would probably be also mocked but it would have put to bed any questions whether this "The Thing" is a sequel, remake or prequel to the average audiences. Seems how I'm bitching I'll throw my suggestion into the ring, I'd call it "The Thing: Origination." Universal has slated "The Thing" to release October 14th, 2011 except this isn't its first slated release date, the prequel was previously slated to release in April. Hopefully this time around Universal won't balk and will actually deliver the goods. Here is the official synopsis: At an Antarctica research site, the discovery of an alien craft leads to a confrontation between graduate student Kate Lloyd and scientist Dr. Sander Halvorson. While Dr. Halvorson keeps to his research, Kate partners with Sam Carter, a helicopter pilot, to pursue the alien life form. No word on a trailer just yet but one can only assume we might see one attached to "Cowboys & Aliens" releasing near the end of the July or "The Change-Up" releasing in the first week of August.